Cook pasta according to package directions. Reserve pasta cooking water for later use. Dry roast almonds in a skillet. Remove and keep aside. Heat 1tbsp olive oil in a large skillet; add onions and garlic; sauté on medium flame until lightly browned around edges, about 8-10 minutes. Add tomatoes; cover and cook till they turn into mush, about 5 minutes. Add spinach and basil; cook till wilted, about 3-5 minutes. Season with salt, pepper & red pepper flakes. Blend spinach mixture with the almonds into a smooth paste. Heat 1tbsp olive oil in the same skillet, add onions and sauté till slightly browned. Add broccoli & chickpeas; cover and cook till tender. 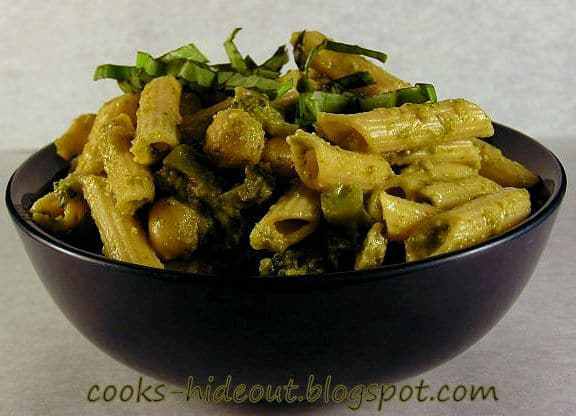 Add the spinach puree and ½-1 cup of pasta cooking water. Season with salt and pepper. Simmer till it reaches desired consistency.